You spend the majority of your pregnancy being seen by a care provider. From choosing your initial OB to meeting with specialty doctors (if needed), you have likely done quite a bit of research on physicians in your area. But as you enter your third trimester, it’s time to start thinking about a provider for someone new: your baby. As soon as the baby is born, your OB kind of goes to the wayside and your pediatrician becomes your go-to for all medical needs concerning the baby. Some pediatricians will come to the hospital after the baby is born while others require an in-office visit a few days after birth. Either way, you’ll need to be sure you have one locked down weeks before your due date so you aren’t scrambling to find a doctor at the last minute. Many women choose to interview a variety of doctors in their areas, while others rely solely on reviews. Still wondering how to choose a pediatrician? Read on. One of the best ways to narrow down your list (or start one) is to ask around for personal recommendations. Do you have any local mom friends who’s parenting styles align with yours? Ask them where they go and to be honest about their likes and dislikes about the practice. If you don’t know many moms in your area, consider joining a local Facebook group and asking there. Another great resource is your OB, midwife, or primary care provider—they are likely to know where their other patients have gone and heard things that could be beneficial to you. While personal recommendations are always best, they sometimes leave out great doctors simply because they are new or just not in your social circle. Spend some time on doctor review sites to see what other patients have to say about pediatricians in your area. You may even come across some bad reviews for a doctor that was recommended to you, which may inform your decision. It may seem odd, but interviewing a pediatrician before the baby comes is actually standard, and normal, practice for new parents. In fact, many doctors even have “meet and greet” days where parents can come to the office, meet the staff and ask the doctor questions. If an office doesn’t have this, simply call up and explain that you’d like to meet the doctor. Sitting down with your top choices face-to-face will really help solidify your decision and make the process much easier. Do you come to the hospital after baby is born? When do we first come to the office after baby is born? Do you have separate waiting rooms for sick & healthy kids? How are emergencies/non-office hours handled? Do you offer same day appointments for sick kids? What are your views on sleep schedules, feeding options, etc. Don’t be afraid to bring a notebook and take notes while they talk—this is an important decision that shouldn’t be taken lightly! This one may seem a bit crazy, but it’s important! While you wait to meet the doctor, sit in the waiting room and pay attention to what is going on. Do people seem to be irritated? Does it seem to take forever for a nurse to call patients back? Are the phones ringing off the hook with no answer? Are there sick kids coughing all over toys that healthy children are also using? Make a mental note (or write these observations down!) and remember that anything you see happening at that moment, is likely to happen during your visits as well. If you feel comfortable, you may also want to ask parents in the room how they like their experience with the practice and the doctor. 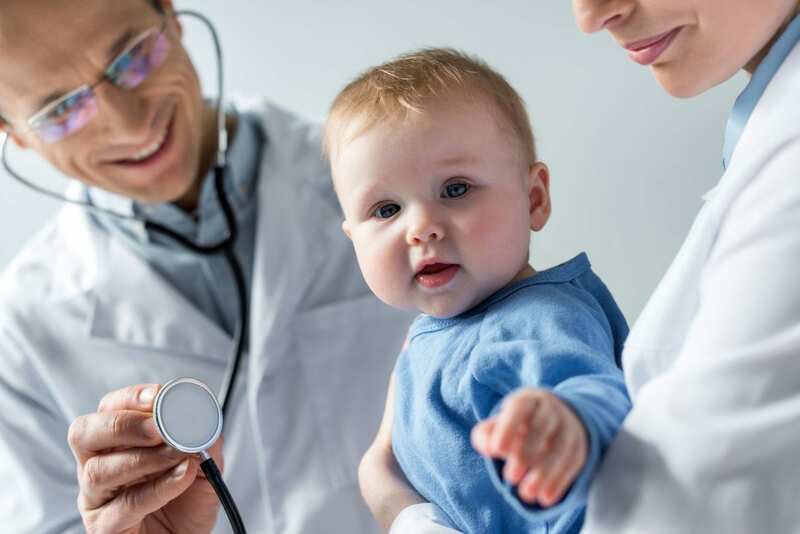 We all imagine our children going to the same doctor from birth until they age out of the practice, but if you do all of these things and still find that you don’t love your choice of pediatrician, you can always make a change—so don’t fret! It’s unlikely that any doctor in your area with the right credentials could be bad for your child, so feel calm in knowing that you’ve likely made the right choice and if not, that choice can always be changed. In the meantime, work to check this task off your list and good luck with your search to choose a pediatrician!